If you could fly anywhere in the world to do research on an upcoming book, where would you most likely want to go? Italy, simply because it’s always ranked as having the best food in the world. Its beaches are nice too. I’ve Googled it. What is your favorite genre to read/write? Young adult (YA), because those stories carry universal themes we can all relate to, a peek into the lives of characters who are more intriguing, real, and raw. What is one silly fact about you? I can mimic Enrique Iglesias’s voice pretty well. I sang “Hero” at a friend’s birthday party once and received an enthusiastic response. Some applauded, others laughed. Overall, though, I felt good about my performance. What got you started on your writing journey? My move from Massachusetts (where I’d lived most of my life) to Virginia. The first year here was difficult. I was alone, depressed, and in completely new surroundings. But it was here in the South that I began seeing all these stories in my head, and that my “writing gene” got activated. So it seems the old saying is true, everything does happens for a reason. Why do you choose to write clean/sweet romance? I don’t choose, per se. I just write whatever I see in my head. And so far, all the romantic parts have been sweet and clean, which is fine with me. What other things do you have planned with your writing for the rest of the year 2013? I’m working on another YA novel that Sia fans should enjoy as well. If things go according to plan, I’ll publish that in the summer of 2014. What is the most rewarding thing about being a writer? Being able to partake in the wildest adventures imaginable, all without ever leaving your house. Do you have a favorite comment or question from a reader? One reviewer said, “It, without a doubt, inspired me to find ways to help others in need. I’m looking into charity work.” I loved hearing that, because that’s exactly what I wanted Sia to do: to motivate others to become their best self, to make positive changes in the world, wherever they are. I find muses everywhere! In books, magazines, poems, movies, YouTube videos, and so much more. I always try to be receptive. You never know what might trigger your next story. What inspired you to write Sia? Initially? Oprah. (laughs). I saw an interview she did on a man with fugue amnesia that impacted me. Fugue amnesia occurs when someone, usually in response to excessive stress, takes off on some unexpected travel. And during the travels, that person assumes either a partial or complete new identity. I found it both fascinating and frightening to think that stress alone can cause the human brain to demand a reset like that. I often wonder why I haven’t gotten fugue amnesia yet! Is it true you wrote the screenplay adaption as well? Yes! I wrote it as soon as the book was finished. I’m about to hire a seasoned Hollywood screenwriter to polish it. When it is up to industry standards, we’ll submit it to film companies and cross our fingers. I think Sia would translate wonderfully to film. If you could sum your main character into five words, what would they be? Determined. Compassionate. Humble. Kind. Brave. Use no more than two sentences. Why should we read your book? Because I believe it will leave you touched, encouraged, and—of course—entertained. While I wait for my driver, I sit on a step outside the school. I watch the kids go by. No one stops to say hello to me, and I'm starting to understand why. Then I see Kyle trudging out of the school, shaking his thick brown hair back from his brow. I decide to go talk to him. But he changes direction when he sees me approaching. He stops, but doesn't turn around. Kyle squints at me, trying to read my expression, so I keep my eyes wide open. If he's looking for dishonesty or cruelty, I'm determined he won't find any there. “Of course you didn't. Don’t worry about it.” I look down the street, past Kyle, but I can't see John and the car yet. I glance down at my nails, still torn and ratty from living homeless. “What were you doing there, anyway?” I ask. “You could say that,” I agree, remembering my wise friend fondly. A dark car pulls up to the curb. I step closer so I can shake it, and while I'm there I purposefully inhale the smell Amber had so detested. She's right. He smells like bread. Banana bread, I think. And cinnamon. Not unpleasant at all. Josh Grayson was born in Mexico, raised in Massachusetts, and now lives in Martinsville, Virginia. It was his move to the South that stirred his imagination and gave him the courage to start writing. When he’s not writing, Josh spends his time reading, jogging, swimming, and watching YouTube videos. Josh currently works as a medical driver, shuttling people all over Virginia and North Carolina. He has also worked as a machinist, film sales rep, administrative assistant, and telemarketer (he apologizes if he called you). 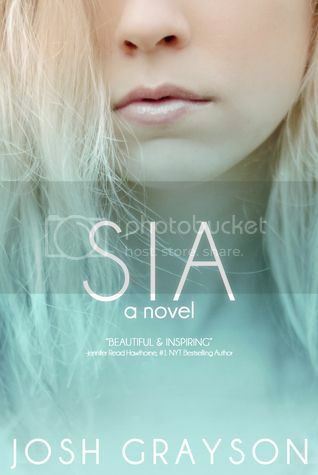 Sia is his debut YA novel.